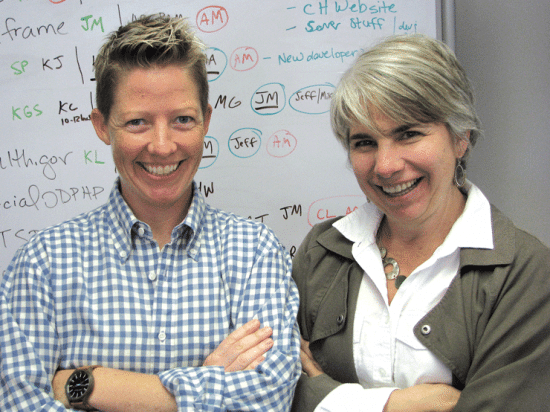 Stacy Robison, left, and Xanthi Scrimgeour saw a need for clearer health information, and turned that need into a fast-growing, multi-faceted business. There’s a gap, Stacy Robison says, between the ability of the public to understand the copious amounts of health data they encounter, and how effectively that information is communicated. But six years after she and Xanthi Scrimgeour launched CommunicateHealth in Northampton, that gap is narrowing — as quickly as their company is growing. At the same time, data showed that people were increasingly struggling with health information at a time when society in general is shifting the burden, more than ever before, onto individuals to manage their health and seek relevant information. So, in 2009, the two left their jobs and launched a startup business from their attic, with the goal of developing and rewriting health-information documents in a way that would be clear and engaging for all readers. By 2011, CommunicateHealth, as they called it, was approaching $1 million in revenue annually; it ended 2014 with just over $6 million. Meanwhile, a three-person operation six years ago now boasts a staff of 36 in Northampton and a second office in Rockville, Md. The Women Presidents’ Organization recently ranked the enterprise 44th on its list of fastest-growing women-owned companies. That rapid success might surprise Robison and Scrimgeour, but only to a point. After all, they knew the vast health-information industry had a need for professionals who could clean up and redesign often-confusing communications. Robison has been rewriting poorly presented health information since her previous career working with federal public-health agencies, and that was initially the bread and butter of CommunicateHealth. But as the startup has grown, it has also expanded its scope of services, moving from a subcontracting role to that of a prime contractor. So she and Scrimgeour introduced a design element into the firm, starting with one graphic designer and boasting four today, and will typically handle both content and design. Meanwhile, web-based health information was becoming more prominent — moving “beyond the brochure,” as Robison put it. With any project, Robison said, the team starts with determining who the audience is and how best to deliver the material, whether it’s pandemic information from the Centers for Disease Control and Prevention or childhood-obesity messages from the American Academy of Pediatrics, to name two past clients. And the process of determining the direction of a project is one that sets CommunicateHealth apart. Government agencies comprise about 70% of CommunicateHealth’s client base, with private entities, from large health plans to small health-information startups, making up the rest. The company will also be handling some communications around upcoming dietary guidelines for Americans, which are updated every five years. “We’ll be supporting that work, so we’re doing a lot of work right now with surveys, focus groups, and background work,” Robison said of the federal-level project. 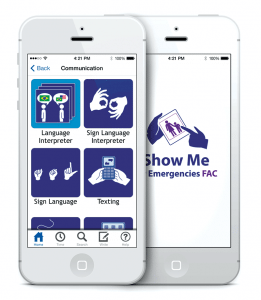 The ‘Show Me’ app developed by Communi-cateHealth helps people with hearing or language barriers ‘talk’ to first responders. Meanwhile, on the state level, she and Scrimgeour took on a project for the Mass. 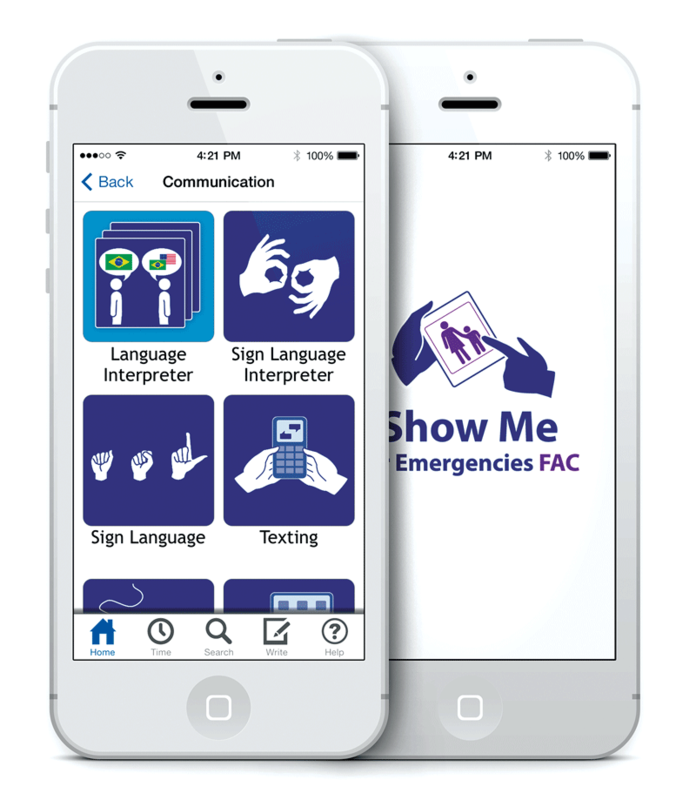 Department of Public Health, developing an app for individuals with communication challenges, from deafness to language barriers, to use to ‘talk’ to first responders in emergencies. Robison, in fact, kept coming back to that back-and-forth dialogue with end users and its importance to every project, whether it’s taking an agency’s jargon-filled content and simplifying it for public consumption or creating something brand new, as in the case of the emergency app. To private companies like health plans, clear communication can affect the bottom line as well, she added. At the same time, she and Scrimgeour have also experimented with work-life arrangements inspired by Silicon Valley that fosters employee growth, autonomy, and satisfaction, including an unlimited time-off policy. Also, Friday afternoons are mandatory “creative time,” where everyone gathers to brainstorm ideas and sometimes help fellow employees stuck at a critical point in a project. CommunicateHealth has risen to prominence at a time when healthcare in general is being shaken up by shifts in how care is delivered and paid for — and when consumers are increasingly anxious about the issues they’re dealing with, and just want some clear answers. Still, the continued growth of CommunicateHealth serves as an inspiring example of two women who turned a passion into a business plan, which then became a local success story with a national reach.